NASA will hold a news conference at 10 a.m. PST (1 p.m. EST) Wednesday, Feb. 22, to present new findings on planets that orbit stars other than our sun, known as exoplanets. The event will air live on NASA Television and the agency's website. Someone broke the embargo and spilled the beans. All seven Earth-sized beans. trappist-1 is around 500 million years old. Life on earth did appear when it was 500 million years old. So, using earth as reference because its all we know, there might be very primitive lifeform overthere. Of course life might be more evolve then that. Natural occuring and evolution of life might be different then here on eath. i wouldnt expect detection of a signal coming from there. But who knows? It is still fascinating. WOW! Last edited by Doum on Thu Feb 23, 2017 1:13 am, edited 1 time in total. This video details a system of seven planets orbiting TRAPPIST-1, a discovery of the Spitzer Space Telescope, operated by NASA's Jet Propulsion Laboratory in Pasadena, California. TRAPPIST-1 is an ultra-cool dwarf star. Over 21 days, Spitzer measured the drop in light as each planet passed in front of the star. 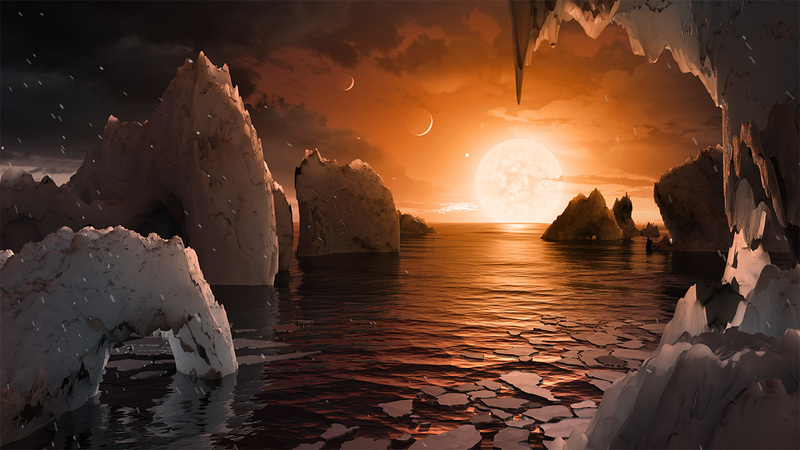 Spitzer was able to identify a total of seven rocky worlds, including three in the habitable zone where life is possible. The study established the planets' size, distance from their sun and, for some of them, their approximate mass and density. It also established that some, if not all, these planets are tidally locked, meaning one face of the planet permanently faces their sun. with their neighboring planets a la Pluto/Neptune. Good question (and observation). Titus and Bode would have loved this system. For all exoplanet fans this news is just fantastic! Ultra cool indeed. Trappist-1 is only about 39 light years away, it has just barely enough mass to even be a normal star (which means it will shine on for 10 Trillion years) and its family of 7 planets (so far) all orbit at an almost perfect 90 degrees to our line of sight! What are the odds? No really, I wonder what the odds of all these factors converging really are, and what this says about the vast numbers of planets that must exist! Doum wrote: trappist-1 is around 500 million years old. Life on earth did appear when it was 500 million years old. So, using earth as reference because its all we know, there might be very primitive lifeform overthere. Of course life might be more evolve then that. Natural occuring and evolution of life might be different then here on eath. i wouldnt expect detection of a signal coming from there. But who knows? It is still fascinating. WOW! TRAPPIST-1 is an ultracool dwarf star that is approximately 8% the mass of and 11% the radius of the Sun. It has a temperature of 2550 K and is at least 500 million years old, though it could theoretically be billions, or even hundreds of billions, of years old. TRAPPIST-1 is at least 500 million years old, and it could be much older. TRAPPIST-1 is somewhat similar to Proxima Centauri when it comes to mass and luminosity, although it is even fainter and smaller than Proxima. Trappist-1 is only about 39 light years away, it has just barely enough mass to even be a normal star (which means it will shine on for 10 Trillion years) and its family of 7 planets (so far) all orbit at an almost perfect 90 degrees to our line of sight! What are the odds? No really, I wonder what the odds of all these factors converging really are, and what this says about the vast numbers of planets that must exist! About 0.8% for the most distant of the planets. Last edited by neufer on Thu Feb 23, 2017 2:03 pm, edited 1 time in total. Yes, the further out an exoplanet orbits, the less likely it will transit as seen from earth. Plus a short observing run can easily miss planets even if they do transit. This entire 7 planet system would fit way, way inside Mercury's orbit (as shown by one of the above graphics bystander posted.) My point is that there could be many more planets than just these 7 very close in orbiters in this system. There's an enormous amount of unexplored space as it were further out from this star. This find is telling us that it should be quite common for the most numerous class of stars to have large numbers of planets. I must agree that the TRAPPIST-1 system is amazing. Imagine a star only 8% the mass of the Sun whose accretion disk also produced no fewer than seven planets that are comparable to the Earth in size and mass! I read somewhere that metal-poor stars have been born out of nebulas that were able to produce rocky planets like the Earth, but no or few gas giants. The TRAPPIST-1 metal-rich nebula produced no fewer than seven "Earths", but not a single Jupiter or Neptune! Saturn's moons. Mouse over doesn't work. In a way, the TRAPPIST-1 system reminds me of Saturn and its enormous entourage of moons. Of course, only one of the Saturnian moons is even remotely Earthlike, and that is Titan. TRAPPIST-1 has seven planets more massive than Titan, but TRAPPIST-1 itself is also more massive than Saturn. My horrible math suggests to me that Saturn is about 0.00034 the mass of the Sun, whereas TRAPPIST-1 (the star) is 0.08 the mass of the Sun. That would make TRAPPIST-1 a bit more than 200 times as massive as Saturn, not an enormous difference. To me, TRAPPIST-1 resembles a scaled-up version of the Saturnian system. Ann wrote: I must agree that the TRAPPIST-1 system is amazing. Imagine a star only 8% the mass of the Sun whose accretion disk also produced no fewer than seven planets that are comparable to the Earth in size and mass! The nebula TRAPPIST-1 and company formed from was metal rich? Where'd ya hear that? Wikipedia lists the star's metallicity at just 0.04+/-0.08 dex. Very Sunlike. Try comparing this system to Jupiter and you'll find a closer match Ann. Anyway, what's nice to see is the scale up factor between our gas giants with their moons and TRAPPIST-1 with its planets. If this is found to be a common trend then there could be many Earth sized moons around super Jupiters and BDs. 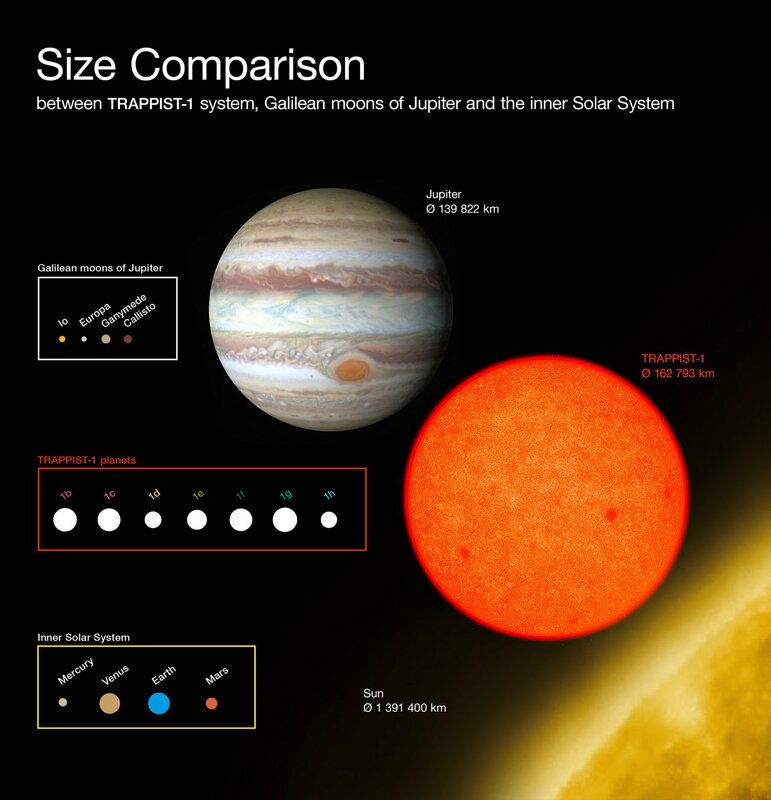 And these comparisons between our gas giants and this tiny RD also would suggest that RDs in general could have great numbers of planets. Happy times for exoplanet lovers everywhere. The star is metal-rich, with a metallicity ([Fe/H]) of 0.04, or 109% the solar amount. This is particularly odd as such low-mass stars near the boundary between brown dwarfs and hydrogen-fusing stars are expected to have considerably less metallic composition than the Sun. Hey, I'm just quoting Wikipedia. 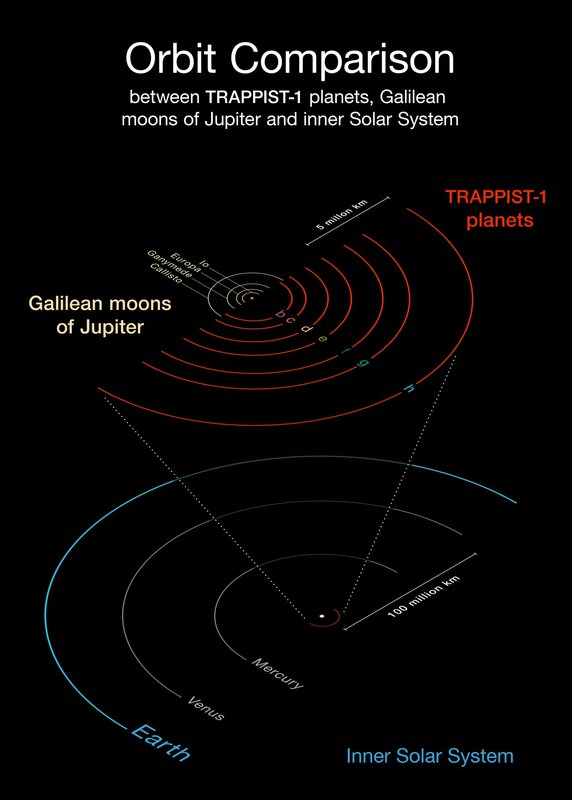 By the way, you were right when you said that the TRAPPIST-1 system is more like Jupiter and its moons than Saturn and its moons. if it is billion years old or more then it change everything. Now that trappist-1 have attract our attention, his real age might be determine more precisely. Its a solar system that scientist will orbit around to study a lot. Im eager to see new publication about it. Here is a link for the habitability of a red dwarf solar system planets. Ah so Ann. I just pulled the dex figure I used from that same article's stellar data table. Note that the error range takes this from -0.04 to 0.12 dex. In more understandable terms that's 91 to 132% of solar, averaged to 109%. Are they saying that the Sun is a metal rich star? Are they saying that the Sun is a metal rich star? The Sun and TRAPPIST-1 are both Population I stars. By definition, they are considered to be metal-rich. You have to remember this is in comparison to Pop II and Pop III stars. Yes, the true current age of this system is critical. Earlier in this thread I stated a 10 trillion year lifetime for this star, just getting that from some anonymous poster on another site. The Wikipedia article gives a 4-5 trillion year estimate. That still gives this system about 1,000 times more time than our star. Astronomers from the University of Amsterdam have offered an explanation for the formation of the Trappist-1 planetary system. The system has seven planets as big as the Earth that orbit close to their star. The crux, according to the researchers from the Netherlands, is the line where ice changes to water. Near that ice line, pebbles that drifted from outer regions to the star receive an additional portion of water and clot together to form protoplanets. The article with the model has been accepted for publication in the journal Astronomy & Astrophysics. In February 2017, an international team of astronomers announced the discovery of a system of seven exoplanets around a small star, Trappist-1. It was against the prevailing theories of planet formation that so many relatively large planets orbited so close around a small star. Researchers from the University of Amsterdam now come up with a model that explains how the planetary system could have originated. Until now, there were two prevailing theories for the formation of planets. The first theory assumes that planets are formed more or less on the spot where they are now. With Trappist-1, that is unlikely because the disk from which the planets had originated should have been very dense. The second theory assumes that a planet forms much further out in the disk and migrates inward afterwards. This theory also causes problems with Trappist-1 because it does not explain why the planets are all about the same size as the Earth. Now, the Amsterdam researchers come up with a model where pebbles migrate instead of complete planets. The model begins with pebbles that are floating from outside regions to the star. Such pebbles consist largely of ice. When the pebbles arrive near the so-called ice line, the point where it is warm enough for liquid water, they get an additional portion of water vapor to process. As a result, they clot together into a protoplanet. Then the protoplanet moves a little closer to the star. On its way it sweeps up more pebbles like a vacuum cleaner, until it reaches the size of the Earth. The planet then moves in a little further and makes room for the formation of the next planet. So now we know where the Trappist Monks are baptized? I think I think, though I'm not sure if I all the thoughts I think I think, or if they come to me from .. goodness knows where.